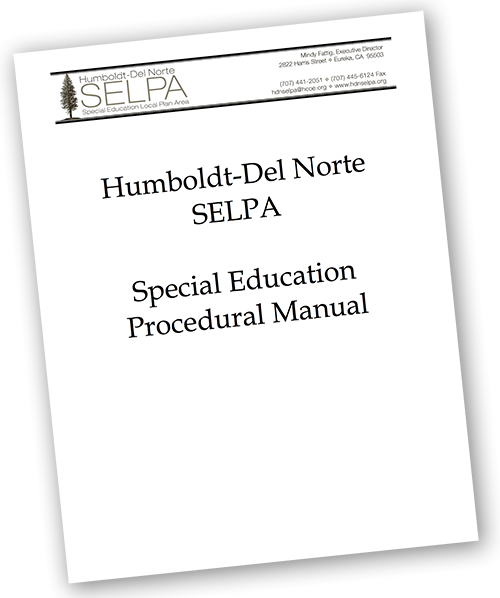 The members of Humboldt – Del Norte Special Education Local Plan Area (SELPA) are committed to meeting the needs of students, their parents, and the staff. In order to implement this goal, the SELPA Procedural Manual describes policies, procedures, and guidelines in place to ensure that students being referred for and/or enrolled in special education program services receive a free, appropriate public education (FAPE) in the least restrictive environment (LRE). The SELPA Procedural Manual is organized into topics. Each topic is outlined by the Definition, Legal Requirements, Legal References, Timelines, Local Procedures and Frequently Asked Questions. For some topics, repetition may occur in Legal Requirements and Local Procedures. However, it is vital that all sections are read and understood in a given topic for the application of Legal Requirements is often explained in the Local Procedures section. Download the entire manual here or find the relevant section below.